“I’ve got these ideas in my head… that urge, wanting to make stuff, how do you describe that?” Emerging designer Ash Allen is a practical man with uncompromising vision. To achieve the striking asymmetric form of the Dollop light, he taught himself ceramic slipcasting – a technique he’d never used before. “It’s not so much that I wanted to learn slipcasting,” he reflects. “I wanted to realize the product.” The result is a bold, sinuous form that implies a suspended movement from the ceiling down. Comfortable in the home, it conceals its ultra-bright LEDs beautifully, unlike so many of its contemporaries. Lionheart stool was initially conceived as a paper form. This clean, functional resolution is typical of Ash’s sophisticated approach to design. Trained in engineering as well as in furniture design, his expertise is in negotiating the entire product life cycle in his head, before his hands begin to work. From concept to material, to form, to making, to market, Ash’s is a resourceful way of design thinking, which first emerged as he renovated his own home and designed its furniture. 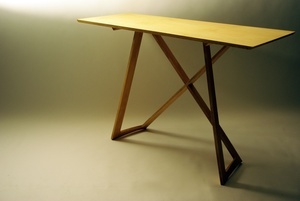 The Stretch desk allows the buyer to put the pieces together without tools or glue. Ash seeks the most efficient and affordable ways to achieve the form he conceives. Alongside this formal approach, he undertakes investigations through play. 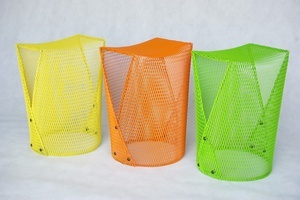 Ash initially conceived his Lionheart stool as a paper form, experimenting with folds. “The curvature in the surface creates strength, but it’s also visually dynamic. I started out to make a storage unit, but the curves seemed to suit a stool,” he says. This entry was posted in CRITIQUE and tagged creativity, design, experimentation. Bookmark the permalink.